When I suggested that instead of an apple it might be a cue ball in Ben Stofer’s left hand in a picture taken at a Lovewell family reunion, I knew Dave Lovewell would rise to the occasion, and he did. Well it could be a cue ball but I doubt if anything as sinful as a pool table was ever allowed in Lovewell. Unlike the wide open town of Formoso which had a saloon or 2 and pool tables in the barbershop, the rowdiest place I have heard of in Lovewell was Dutch Wurth's drugstore where Dutch lit off a firecracker in Rolly Ballard's back pocket. My only memory of Dutch was of an old blind man with yellow fingers from chain smoking Camels. Like Mayberry Lovewell did usually have an Otis or 2 but most who dared tipple did it out of sight or out of town. To recap: A few backs while I was scrutinizing that blasted Pikes Peak photo one more time, trying to coax out another secret or two, it suddenly hit me that in a recent posting I had written “March” as the month when a Lovewell reunion photo was taken, instead of “May” which was what the caption said. What made me write that? Well, it looks rather like a raw, bleak day, even though the children aren’t wearing coats. The trees are bare, the old folks are wearing blankets and overcoats to ward off a chill, and now, as Dave Lovewell points out, Ben is holding an apple, a fruit which suggests the photo was taken late in the year. As we sift through pieces of evidence, some of it from Kansas newspapers, a number of clues point to the fact that, in spite of its caption, the picture was taken on an unusually mild December day in 1913. Now, back to that photo from fifty-three years earlier, which I believe was taken at Riley’s Gulch, near Denver. I happened to be staring at the photograph after reading about the death of Cleora Alice (“Alla”) Oakes, daughter of the author of a famous guide to the so-called Pikes Peak gold fields, in the summer of 1859. According to a biography of Oakes, as mandated by Victorian custom, Cleora Alice's father, D. C. Oakes, was expected to wear a black armband of mourning. Out came the magnifying glass. It’s hard to see, since the man whom I contend is D. C. Oakes wears a dark woolen coat. Only the play of sunlight on fabric gives it away. The coat has a rough texture, but a few inches of sleeve under the left shoulder look darker and give off a different sheen than the rest of the coat, something closer to what we might expect of black satin. The man who may be Oakes seems to be wearing a black armband. Besides helping to substantiate the wearer as Oakes, could it help us date the photo? Yes and no. The period of mourning for children in the Victorian era could last up to nine months, and Cleora Alice Oakes died in June of 1859. Worse yet, Daniel Chessman Oakes lost three young daughters over a span of three years. The very next year, little Eliza died in October. If the armband were for Eliza rather than “Alla," we would have to push the date of the photo to late fall of 1860, when Thomas and Solomon Lovewell were unavailable for the group portrait near Denver. Thomas was by then well on his way to California, and his brother Solomon was already making a home in Washington Territory. 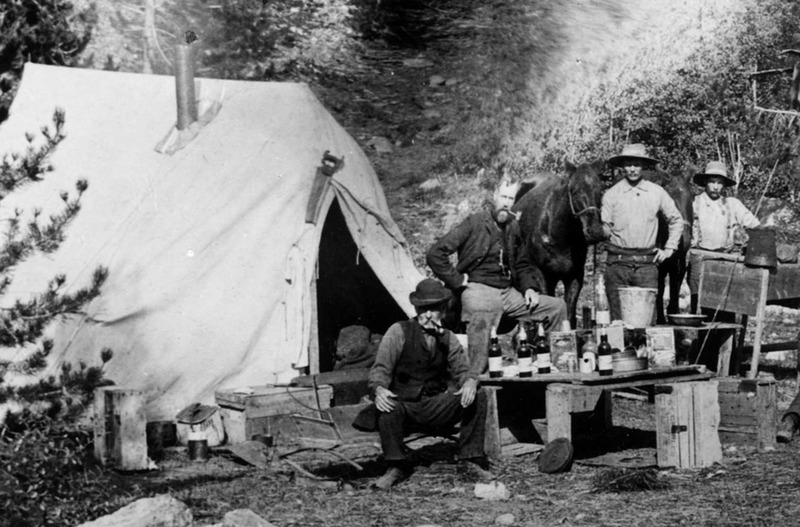 However, I believe the picture may have been taken very late in 1859 or very early in 1860 for three reasons: One relates to the marketing of a very famous guide book, another is the weather, and the third is the appearance of a certain tent. The wagon in the picture may have belonged to Oakes himself. During his back-and-forth travels between Denver and Iowa, D. C. Oakes was heartened by the power of glowing descriptions in the Pikes Peak guide books to produce a flood of new arrivals. Before leaving Pacific City he ordered more copies of his own pamphlet. Even though it was already widely distributed, he hauled a slew of them to sell to travelers he met, perhaps in an effort keep the Pikes Peak frenzy going in the coming year. The message on the wagon sheet, which is painted in a breezy, free-form style with some faded or missing letters or parts of letters, may have been intended to read: “Pikes Peak, or Bust. Oakes’ 1859 Guides” (The name as painted, looks more like “Okie’s”). The second line is faded, or painted in a color that photographed as a light shade of gray, except for the date. The photograph was probably taken either very late in 1859 or early in 1860, when Oakes was still wearing a black armband for “Alla." The year “1860” was painted in dark numerals over a faded “1859,” either after the end of the year or in anticipation of it. The weather at Riley’s Gulch was glorious from November 1859 through February 1860, even in the mountains. Men working indoors in mid-January seldom bothered to light a stove. Autumn of 1860 was another matter. Wintry weather held off until Hallowe’en, before snow and frigid temperatures settled in and stayed put. Finally, there is the matter of the tent. When he was in the vicinity of Denver in 1859, D. C. Oakes lived in a tent like the one he’s proudly standing beside in the photograph. He hauled his wife and two children from Iowa in November 1859, but the house that was being built for them wasn’t quite ready yet. Mrs. Oakes remembered living for a while in a tent, before moving into their new home. I’m guessing that D. C. Oakes and Abram Walrod may have used the tent as their man-cave for a while before joining their wives in civilized comfort. I believe the date of the Lovewell family reunion photograph and the Pikes Peak photograph both can be pinned down by a few clues, visual and historical. And, oh yes, I still believe that one man probably appears in both photographs.